Well I made the J.Crew rounds this weekend – a speedy trip to the outlet on Saturday followed by a trip to the Retail B&M. I ventured up to the Crewlet in hopes of finding the Factory version of the swiss-dot Tippi that was sold out online and I was convinced I had to have it. The whole store was 40% off and while I tried more on at the store, here’s what came home. My Crewlet dressing rooms are incredibly narrow and…yeah…I don’t know how all you ladies post so many nice looking dressing room pics because mine just…aren’t. More on that in my Retail post. This sweater is sold out online but my store had a full size run in it. The fabric content is 37% viscose (aka rayon), 35% nylon and 28% merino wool. Yeah, it feels synthetic. And a bit warm. As you can see from the second picture, the dots don’t go all around the back of the sweater as the retail version did. There are also less rows of the dots on this version. I’m still kind of convinced I had tunnel vision on this one and I’m still not sure I’m keeping it, as now I’m obsessing over whether or not I want to pay for the retail version that is still floating around on eBay for double what this Factory one cost me. Decisions. The fabric content is probably irking me the most on this one, and I’d like a few more rows of dots. I took a medium in this sweater, which is my usual Tippi size. Pink+Navy+Stripes = sold. This was $29.50 with the discount, 100% cotton. It’s not a work sweater but I loved the bright pink cuffs. And the stripes. Obviously. This is a medium. I prefer a more fitted look for these sweaters, any larger and it would look sloppy. This link is to the heart version of this blouse – I don’t see the polka dot version online. I liked the flowy fit on this and like it better in person than on the pics. 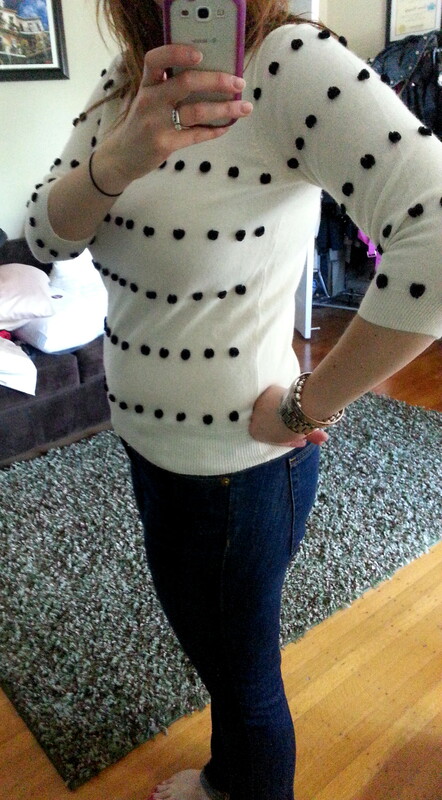 Not sure what possessed me to wear white jeans when taking fitting room pics but yeah…mental note for next time. This is a medium as well. 100% polyester. Yeah, synthetic again, but I’m ok with the way this one feels. It is sort of sheer so I guess a tank underneath may be necessary. I have a few other items arriving this week – the polka-dot tie neck top from Factory as well as the Emery bow flats in black (yay!) My store did have these but not in my size. I did spot the Factory version of the Janey flats and have to say I was underwhelmed. I haven’t tried on the retail version but these were definitely blah in my opinion and is likely based on the fact that they seemed plastic-y. So that’s it for today – what do you think? Are you finding anything you like at Factory lately? Would love to hear what you think and thanks for visiting! I’m not sure what I think about the dot Tippi.. I see what you mean about wanting one more row of embellishment. 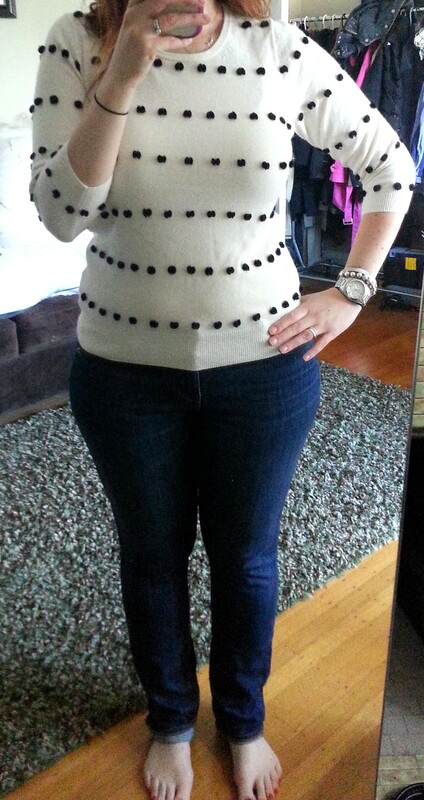 I love that stripe sweater w/the colorblocking. I tried that on & really liked it. A v-neck is very flattering on most everyone. Thanks SO much for these pictures! If it makes you feel better, I can’t take my own pictures, LOL! I don’t see how anyone does it. About the Tippi: I agree, it needs another row of Pom poms. It’s not bad as is though!